Harney County Save A Stray Rescue » Our First TNR Clinic!! On April 29th, 69 feral cats in Harney County from 3 different colonies were spayed and neutered. Save A Stray has been working closely for months with The Bend Spay and Neuter Project getting this event put together. 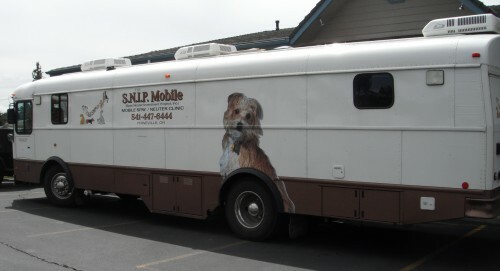 Bend SNIP brought their mobil bus along with 6 volunteers of which 3 were veterinarians and they did all the surgeries in one day. There were also 8 Save A Stray volunteers working very hard to make this clinic a reality by doing the actual trapping and assisting with the recovery process and preparing the cats to go back to their colonies. With the support of the community this will be the first of many more of these TNR (trap,neuter,return) clinics we hope to have because there is such a need in Harney County to stop the overpopulation of wild cats. Most of the time feral or wild cats are being fed so by getting them all spayed and neutered they become better working cats by keeping the rodent population down in the areas where they live. Not only that they are much healthier cats that won’t be spreading any diseases. Every cat getting altered gets a thorough examination, fluids, wormed, wounds treated, shots, including rabies, matted hair shaved and then their ears are tipped so that it will be easy to tell that they have been previously altered if they get into a trap in the future. If you are feeding feral cats please call Save A Stray as we want to know where they are and how many are in each colony. We know there have already been more kittens born this spring so we have to keep moving forward and hopefully do this again in the fall when the kittens will be big enough for surgery.